A 52% majority of Britons voted in favour of leaving the EU; Prime Minister Cameron has announced his resignation. The Brexit decision will have moderate effects on the EU in the short-term through uncertainty in investment and trade, as well as in the long-term primarily through trade. Insolvencies may rise in the short term, especially in Ireland, the Netherlands and Belgium, due to close trade and investment ties. The remaining European countries would see little impact. Corporates operating in the transport equipment, food, textiles, electrical equipment and chemicals sectors are most exposed due to trade linkages. On 23 June 2016, the UK voted to leave the European Union. While the uncertainty of any future deals could impact trade in the long term, existing trade agreements will limit short term volatility. Brexit could trim 1% to 3% off of UK GDP by 2018 and could be more in the longer term, depending on the trade arrangement agreed upon. The economic ties between the UK and the rest of the EU are among the deepest in the world so the EU would also feel any disruption or slowdown in economic activity in Britain. In this research note, we assess the effects that the ‘leave’ vote could have on businesses in the rest of Europe. In the near term, Brexit negatively affects business and consumer confidence as the UK moves into unknown territory. Business sentiment has already deteriorated and companies are delaying hiring and investment decisions ahead of the referendum. 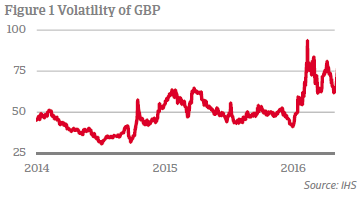 The GBP exchange rate has depreciated more than 5% in trade-weighted terms in 2016 while the implied volatility has also risen sharply. The UK will now undergo negotiations with the EU to determine, among other things, the trade arrangement between the two economies. There are several outcomes that the trade negotiations could lead to, ranging from WTO rules (least desirable) to a EU-UK free trade agreement (FTA; most desirable). Depending on the outcome of the negotiations, many new tariff and non-tariff barriers may come into place and/or negotiations may go on even longer. This negotiation phase will take two years and negotiating an FTA could take even longer. As a result, uncertainty will persist in the coming years which would continue to be reflected in financial markets and business sentiment. Borrowing would also become more expensive for UK firms, as risk premia are likely to go up, especially for those companies which are dependent on trade with the EU. For other European countries, both short-term and long-term economic impacts would generally be felt through two channels: trade and investment. Continental Europeans would also be affected by similar decreases in sentiment and rises in risk premia. 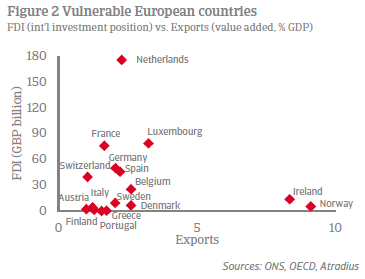 Countries with a large stock of foreign direct investment (FDI) and other assets in the UK, such as property, equities and bonds, would see the euro value of their assets decline in the wake of a Brexit. This could cause foreign investors to become more reluctant. Furthermore, countries with close trade ties to the UK, as measured by exports to the country, would also feel pressure from the lack of certainty about the final trade arrangement. In the more medium term, any barriers to trade would have negative impacts. These trade and investment linkages are presented in Figure 2. There are a small handful of countries that are more exposed than the rest: Ireland and Norway in terms of exports and the Netherlands in terms of FDI. Luxembourg, France, Germany, Spain, Switzerland and Belgium also stand out in both respects. The rate of business failures is very closely linked to developments in GDP, so a deterioration in economic growth should have adverse consequences for the business environment. Most GDP impact studies focus on long-term impact, but the commercial focus is more immediate. Real disruptions to trade would not occur until late 2018 when the UK would leave the EU. In the near term, Atradius expects the uncertainty felt now – causing investments to be postponed and business sentiment to weaken – to lead an uptick in insolvencies across several European countries with close trade and investment ties with the UK. In order to forecast the impact on insolvencies, we use the OECD near-term GDP forecasts for Brexit. The effects are cumulative over the coming two years. These short-term impacts are primarily financial through two channels: first is through shocks to financial conditions and confidence in the UK alone and second is shocks to financial conditions in Europe. The drag on growth is most acute in the UK (-1.35 percentage points). The other forecasts are according to groups of countries together with comparable levels of vulnerability to the UK, broadly in line with the countries we identify as most exposed. We apply the aggregate group forecasts for each individual country as an indicator of effects on GDP. Our insolvency forecasts are presented in Figure 4. 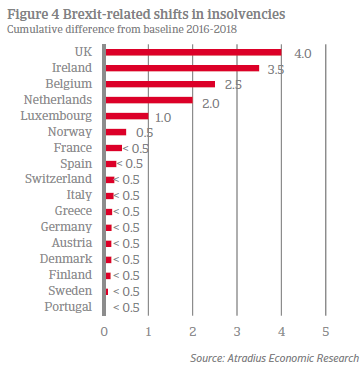 As would be expected, the countries with the closest trade and investment ties with the UK are those that are forecast to see the sharpest rise in insolvencies. The effect on bankruptcies in Ireland are expected to be nearly as strong as that to be felt in the UK since Ireland sends nearly 10% of its GDP worth of value added exports to the UK. Belgium and the Netherlands are also forecast to see 2.5 and 2.0 percentage point higher insolvency levels respectively than otherwise through both trade and investment channels. Luxembourg and Norway would also likely see a higher than otherwise level of insolvencies by 2018. The remaining countries (including closely tied countries like Switzerland, France and Germany) are all forecast to only see 0.5 percentage point or less increase in insolvencies. A closer look at these vulnerable markets offers an indication of the trade sectors that may be most exposed to the UK exit. As mentioned, uncertainty is the key player in the near term that could affect GDP and insolvencies. In the longer term, trade is the primary channel as it would only be effectively disrupted from 2019 on after the UK officially leaves the EU. However, the deterioration in confidence and potential decrease in UK import demand (resulting from the weaker pound) in particular could lead to short-term impacts on trade sectors as well. Figure 5 presents which sectors in which countries are most reliant on the UK for their exports. Across Europe, the sectors that derive significant value added from exports to the UK are transport equipment, food, textiles, electrical equipment and chemicals. These sectors are likely to suffer most. 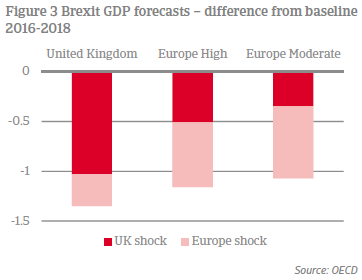 However, the sectors most exposed to the UK tend to be small relative to the size of the economy, so that the impact of the Brexit on the total economy will be much smaller. Large sectors such as public services and construction do not have that much exposure to the UK. The impact on Ireland would span more sectors than other countries – particularly manufacturing, food, and metals. The electrical equipment sector in the Netherlands and Luxembourg could be vulnerable to elevated insolvencies while textiles and chemicals could face obstacles in the Netherlands and Belgium. While Norway is not forecast to see a large effect on bankruptcy rates due to Brexit, its chemicals and metals sectors are highly exposed due to the high ratio of exports to the UK. If followed by any trade impediments, most of these countries would see parts of their economies negatively affected and would likely become more reluctant FDI investors in the UK. Amsterdam, June 24th 2016 - After weeks of speculation the future path for the United Kingdom’s relationship with the European Union is confirmed.